Survey Results: What's Your Biggest Challenge With Content? Whether you’re a marketer or not, engaging in active listening can be one of the most important methods to broaden your learning. So we’ve done just that. In our latest survey, we asked 1,000 marketers seeking help with their content marketing one simple question: “What’s your biggest challenge with content?” No multiple-choice selections or series of check boxes. Just an open-ended invitation to reply — and to allow us to listen. Marketers were actively seeking content marketing information at the moment they were surveyed — which could affect the overall level of expertise expressed in the results. 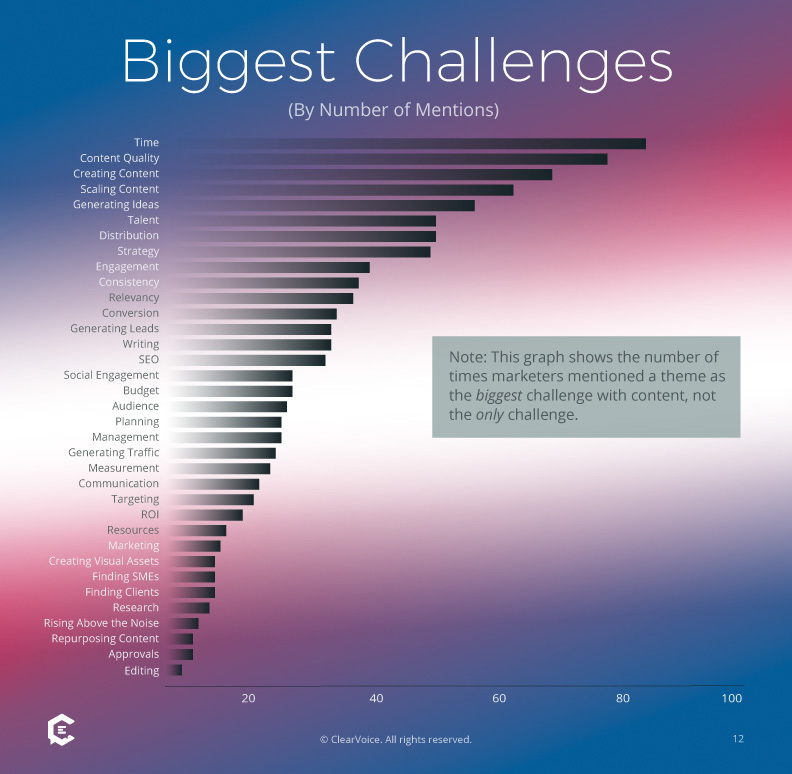 Each marketer submitted their biggest challenge with content, not their only challenge. Responses ranged from single-word submissions (roughly 29% of all submissions) to multiple sentences in length. Our category breakdowns include percentages of responses by themes within their respective category. See our methodology. Time is the single greatest challenge with content…. Or is it? Marketers mentioned challenges related to time more than any other theme. Even the word “time” itself appeared as the most frequent single-word submission among the 1,000 replies in our survey. But is the obsession with the clock really just about seconds ticking by? Perhaps not. Although having enough time to execute any plan might be a challenge, an underlying factor could simply be organization, or the mere prioritization of tasks and goals from the get-go. Nothing puts more pressure on time than having too many goals, especially if any are unfocused or unrealistic, or lacking an organized process to achieve them. So if time is your greatest challenge, perhaps a thorough review of your content strategy or a total overhaul of your approach to time management might help. For better planning, start by creating a foresight calendar for your brand. Creativity and quality flummox marketers far more than strategy or analysis… But isn’t it expected? 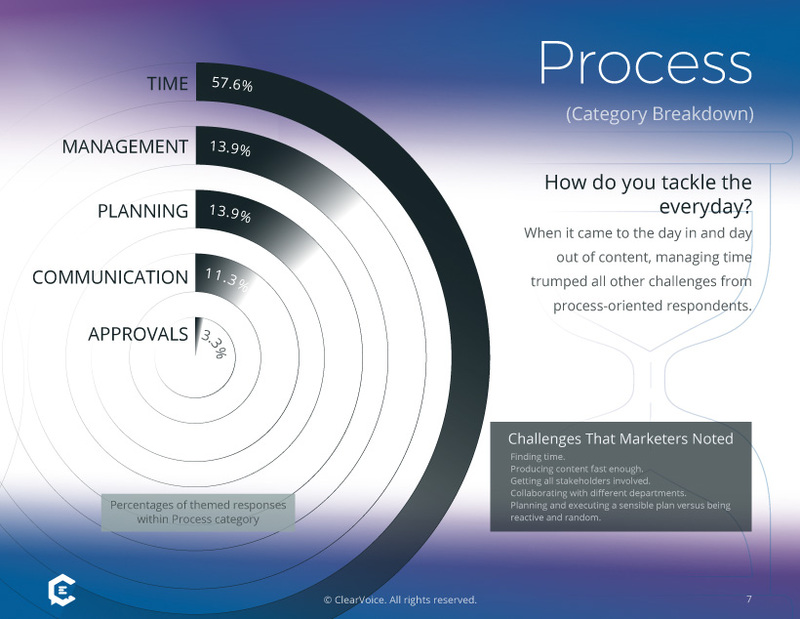 When it came to categorizing marketers’ greater challenges, themes related to the production of content (i.e., the creativity that drives it) and its ultimate credibility (e.g., quality and relevance) led as the largest areas of concern. 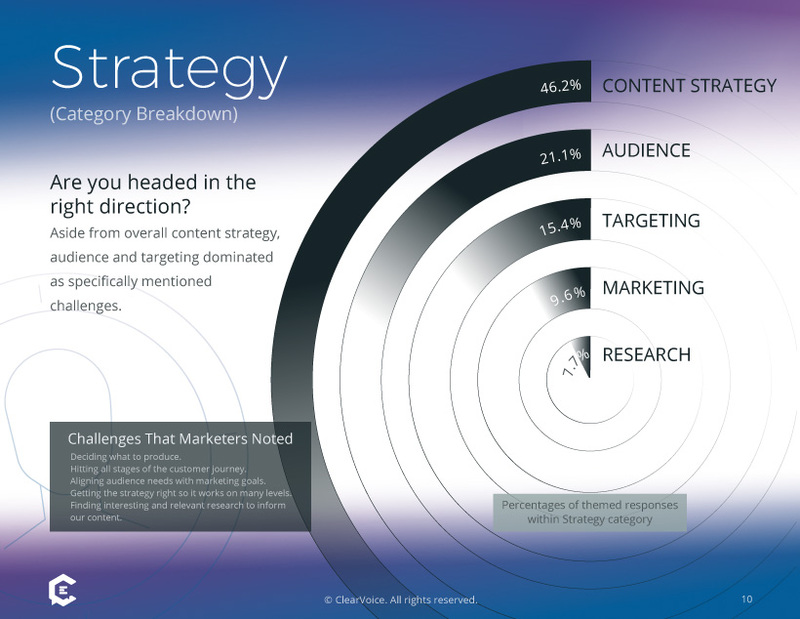 And maybe it stands to reason… If only 1 in 10 marketers cited strategy as their biggest challenge, perhaps most know what they want to achieve with content but are far less confident in how to make it happen. 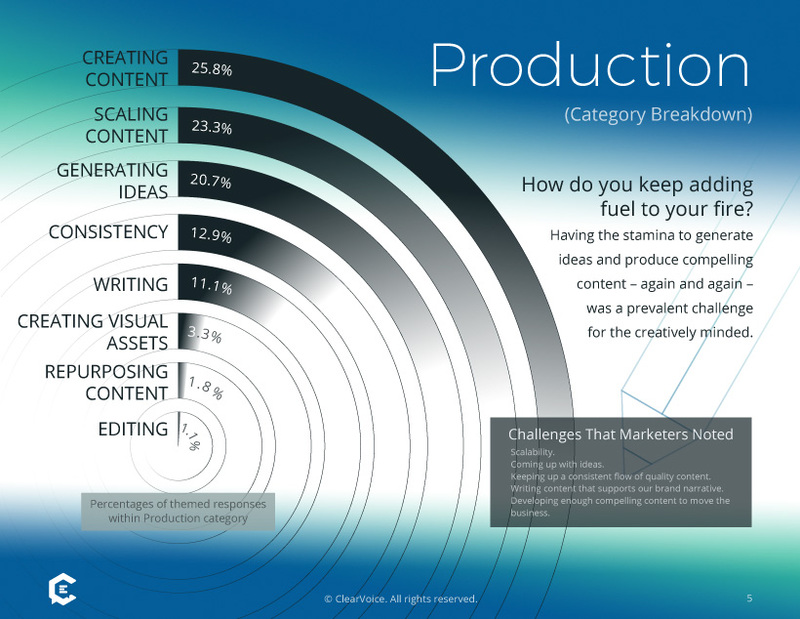 Just “creating it” leads the pack of production challenges… Or perhaps knowing where to start? Marketers used the phrase “creating it” more than any other single phrase in articulating their challenges. Simple. Concise. Yet, could it signify a general lack of direction in knowing where to start, or, conversely, a matter-of-fact assessment that, yes, creating content takes effort, Captain Obvious? To pull a classic line from theatrical studies: Drama is in the doing. When all factors are combined, the creation of content — from generating ideas and finding talent to revising work and optimizing it for distribution — can be a laborious process. “Creating it” is a convenient catch-all phrase, whether you’re a jaded expert or a newbie to content marketing altogether. Quality itself confounds more than engagement… Or is it a chicken-and-an-egg problem? When it came to the credibility of content — the aspects through which audiences connect with and establish trust with a brand — marketers were twice as challenged by the quality of content than its ultimate ability to engage. That being noted, one could argue you can’t engage without having quality content to begin with. Time remains ever elusive… But does it speak to a broader challenge about process? 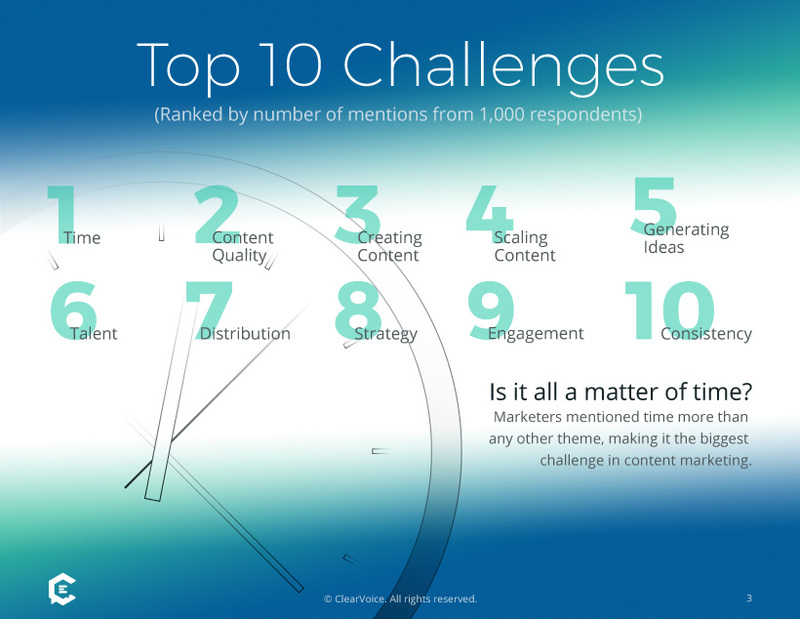 As mentioned earlier, time was the number one challenge with content across the board. However, when people say they “don’t have time” for something, they might not mean they literally do not have time. Not having time could mean a lack of commitment, a lack of organization or process, or a general lack of resources. If we were to do a secondary survey, we might further investigate the challenges with time itself by asking marketers about specific points in their process where they seem to waste or misuse time the most, whether because of inefficiencies or common obstacles. Marketers want attention wherever they can get it… But do specific channels matter as much as we think? In our entire survey, marketers mentioned Google only once, cited Facebook just twice, and identified no other specific distribution channels by name as their biggest challenges. At first, we thought this was rather surprising, but in a time when new distribution opportunities seem to pop up every day, whether in the latest apps or online streams, perhaps it’s a sign of segmentation fatigue: There are just too many distribution channels to consider when developing a fully integrated content strategy. Marketers in our survey seemed most focused on tried-and-true search and social sharing as the most important behavioral methods for connecting with their audience. So maybe it comes back to basics: If the message matters more than the method (the behavior of connection), then perhaps the method, in turn, matters more than the medium (aka distribution channel). Converting and generating leads are equally challenging… But does their cost not matter so much? 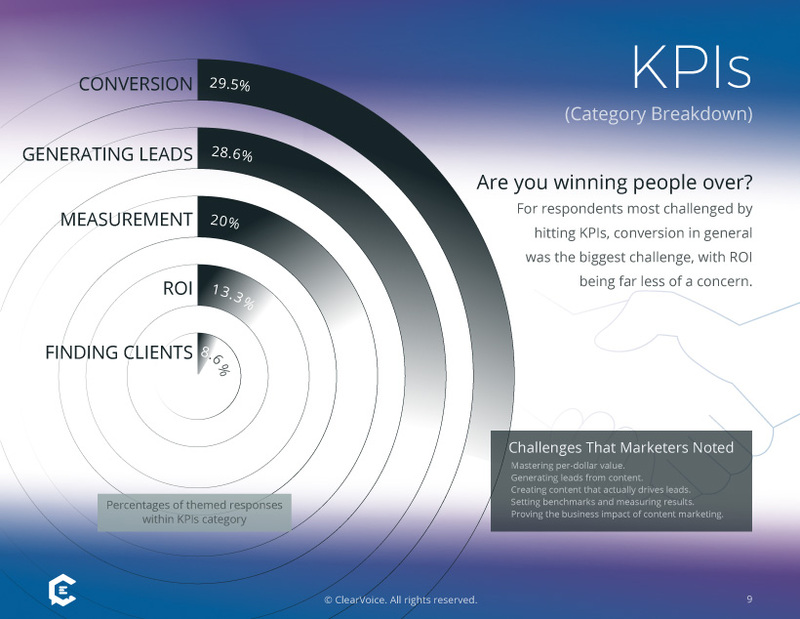 When it came to respondents concerned most about hitting KPIs, 6 in 10 marketers found converting or generating leads as their biggest challenge. By contrast, only 1 in 8 cited return-on-investment as their most looming pain point with content. Audience and targeting dominated as the specific challenges with strategy… But maybe a little research could go a long way? Although “research” showed up as the biggest content challenge for only a small percentage of marketers, the interpretation could go either direction: Maybe most marketers have done their homework (and know how to research) or, on the contrary, most haven’t (and don’t realize the importance of informing their content with data). We’re hoping the former is true. 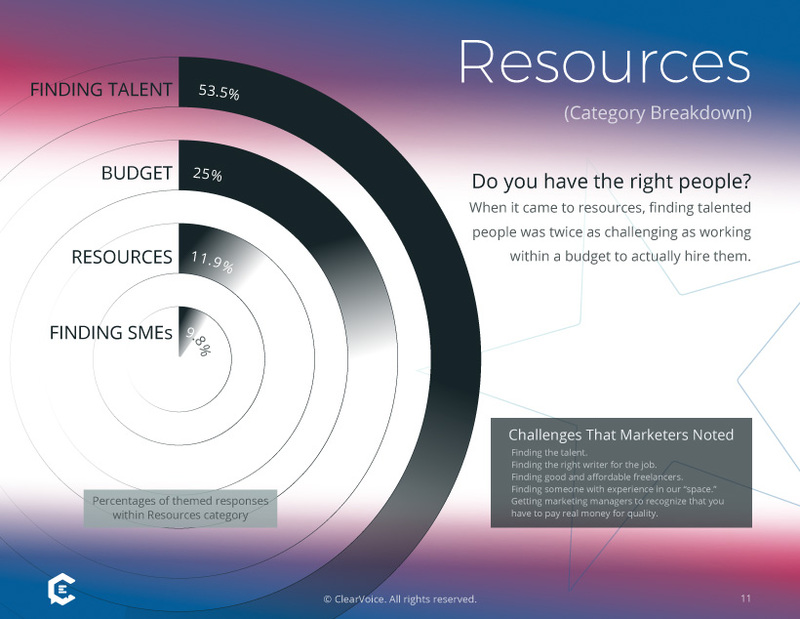 It all comes down to this: Finding good talent is hard… But it doesn’t have to be. Of course, there are affordable solutions to this dilemma, where you can easily find and hire vetted freelancers to make your message come alive. 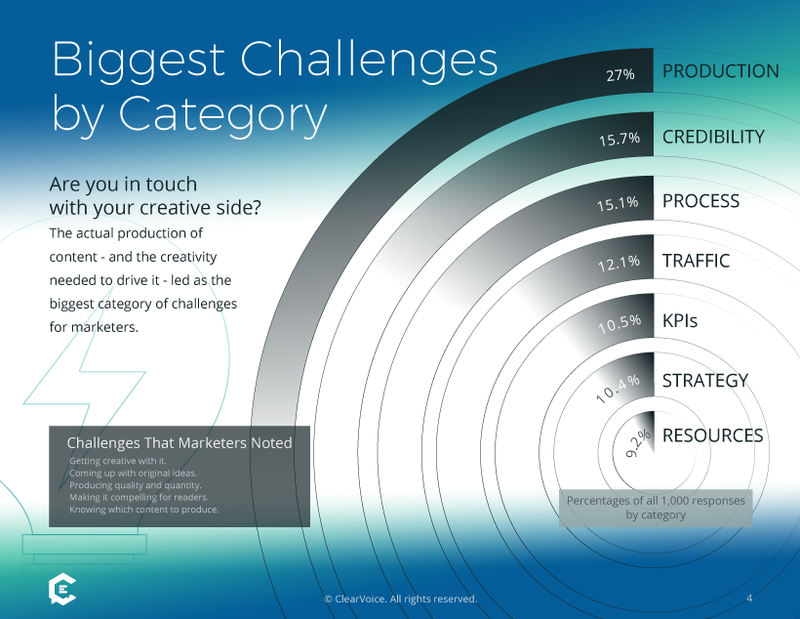 When you review our final tally of challenges categorized by theme (shown above), remember that we asked marketers about their “biggest challenge” with content, not their only challenge. And taking in consideration that respondents were actively seeking content marketing information when they replied to our survey, the results might have cascaded in a completely different order had the group of respondents been a differently targeted audience. For instance, had the targeted group been primarily editorial professionals and publishers, we would have expected to see a substantially different set of challenges. There’s little doubt “editing” and “approvals” would have been closer to the top of list and not the bottom. Agree? As part of a ClearVoice survey, which ran January – September 2017, we asked 1,000 marketers seeking content marketing help a simple question: “What’s your biggest challenge with content?” Respondents submitted answers in their own words. We provided no multiple-choice selections or other contextual prompts. We categorized replies, which ranged in length from single-word responses to multiple sentences, into 35 themes based on keywords and recurring sentiments. We further categorized related themes and rolled them up into seven main categories. All survey submissions were individually written, so we made the best attempt to capture the true intent of each response. For example, a submission that cited “finding new topics that don’t sound like old topics” as the biggest challenge was categorized under the “Generating Ideas” theme in the “Production” category. Although “generating ideas” wasn’t specifically mentioned, it clearly was the intent or theme of the response. Additionally, roughly 1 in 8 responses identified more than one “biggest challenge,” and we assigned them to multiple categories accordingly. As the process for categorizing responses required interpretation beyond objectively identifying specific keywords and phrases, it’s possible that another review of the responses could yield different themes and results in the survey analysis. Download the full report: 1000 to 1: What’s Your Biggest Challenge With Content?